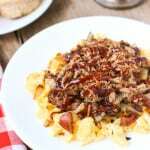 This BBQ pulled pork egg scramble is the perfect way to use pulled pork leftovers. You'll crave this savory brunch dish with bacon, potatoes, and onions! Prep all ingredients so the following steps come together more quickly: peel and dice potato, slice onion, etc. Heat approx. 1 tbsp of oil in a frying pan on stove top over low heat. Add onions and allow to cook and caramelize while you prepare the rest of the ingredients. Stir occasionally just so the onions don't stick. While bacon is cooking, heat remaining olive oil in a frying pan over medium heat. Once heated, add potato chunks and saute until browned to your liking and semi-crispy. Season to taste with salt and pepper. Once the potatoes and bacon have finished cooking, set aside. Heat pulled pork and BBQ sauce separately if they're not already warm. Whisk together eggs and milk and add to a greased frying pan. Cook until eggs are light and fluffy. Once eggs are cooked and scrambled, add onions and mix together. To assemble, add scrambled egg/onion mixture to a plate and layer potatoes, bacon crumbles, and pulled pork. Top with a drizzle of BBQ sauce. Repeat for the remainder. This recipe is adaptable to your tastes - feel free to prepare eggs, potatoes, bacon, pulled pork as you like 'em. The combination of flavors and ingredients is what's key here!